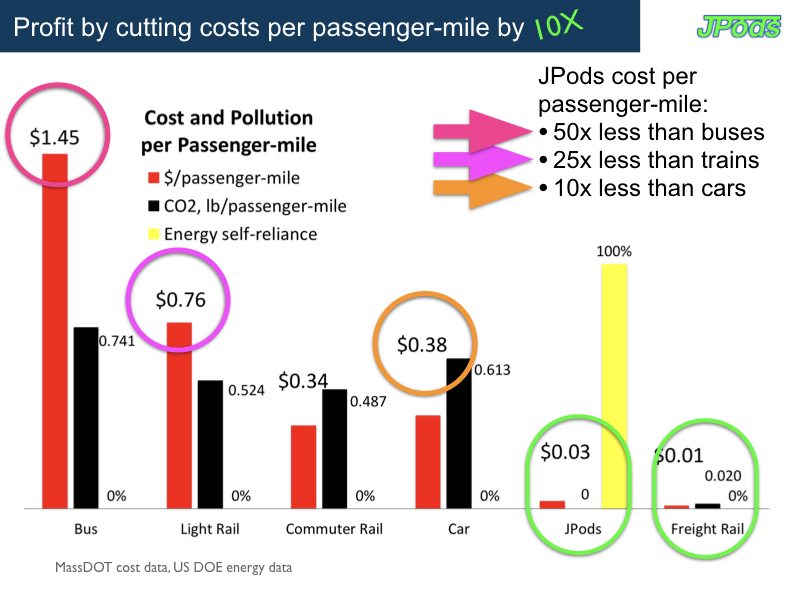 Here is a graph of costs/polluiton per passenger-mile. There is very little difference in pollution from cars, buses, and trains. Cleaner: Solar powered mobility networks preempts operational pollution. Cleaner: JPods require no street parking. It is well documented there are 3.4 parking space per car with a strong indication that in many locations there are eight parking spaces per car. Parking cars add clutter to cities. Air pollution from exaust and ground pollution from paving makes cities dirty. Convert the distributed nature of transportation network into solar collectors. Drive Parasitic Mass towards zero. Current transportation, where we pay for moving a ton to move a person, is too wasteful to take advantage of solar power. Deregulate transportation so it is open to innovation. Current regulations mandate delays, more highways, more oil dependence and other restrictions beyond the ability of most innovators to navigate. There is harmony and synergy between transportation's need for power across a network and sunshine's ability to delivery distributed power. Elimination of Parasitic Mass and power from natural sources is enough to stream resources to need on-demand. At a 65% savings from oil-based transport, it is practical to build a circulatory system for each economic community. FTE is Freight Train Equivalent. Long-haul freight and sea borne shipping set a "gold standard" of about 436 ton-miles per gallon of diesel. With that level of efficiency Global Warming and Peak Oil would not be problems. We know we can move a ton 423 miles using one gallon of fuel (diesel). Yet in half of the eight billion miles Americans drive daily in congested, repetitive travel we move a person 18 miles using one gallon of fuel. There is no energy crisis; there is a waste of energy crisis. Ending the waste, ends the crisis, which in turn, can stop Global Warming.